Hi there! I am Laura from Inspiration for Moms and I’m thrilled to be visiting you today! 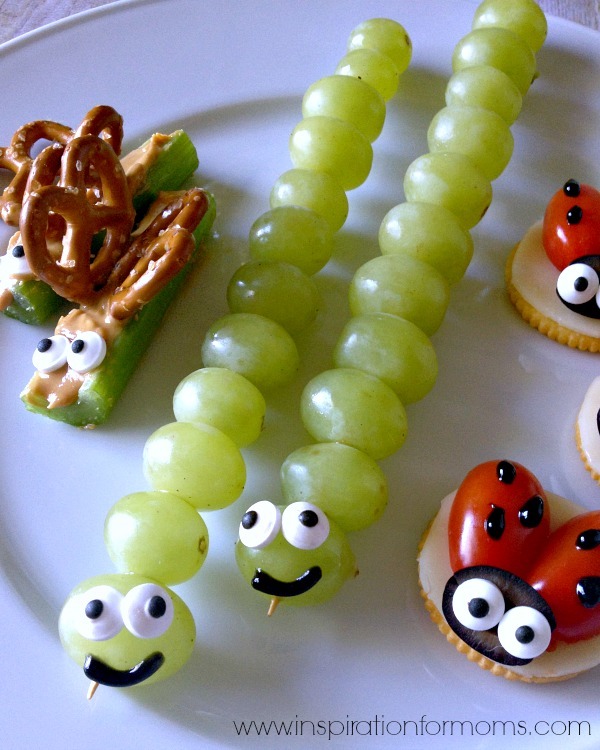 I have the perfect snack for our Bug themed week. 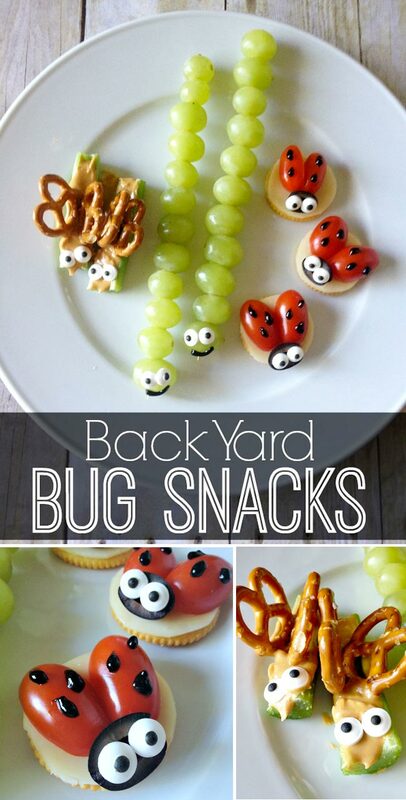 My Back Yard Bug Snacks have a little something for every bug lover. 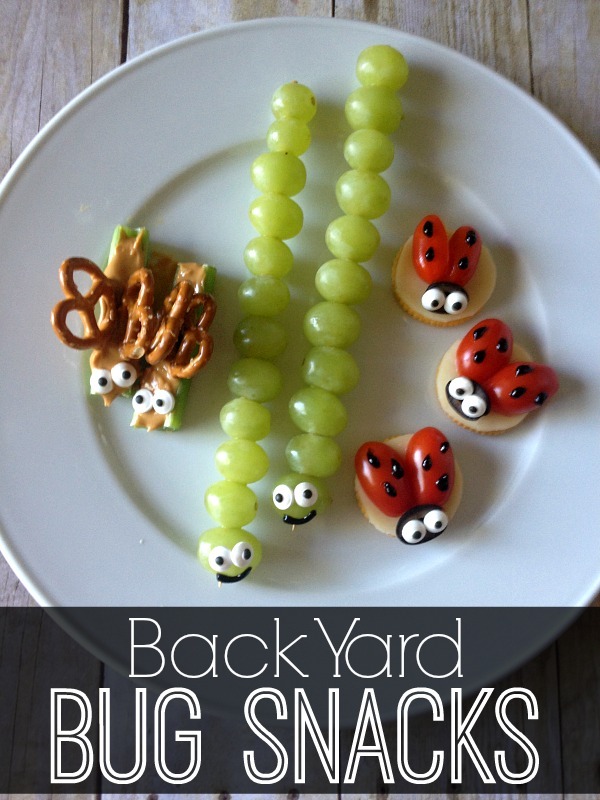 Your kids will totally enjoy creating these easy eatable butterflies, caterpillars and ladybugs. Let’s start with those nutty Butterflies. 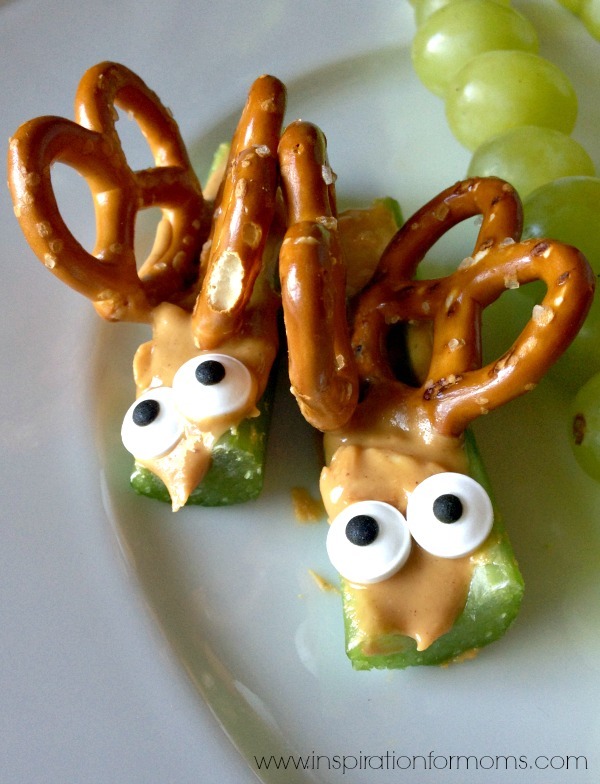 Slice a few celery sticks, fill with peanut butter and top with some pretzels. Finish it off with a few candy eyes to make these flying bugs complete. And of course, every back yard has a ladybug or two. A cracker topped with provolone cheese holds a cherry tomato with a black olive and a few candy eyes. I speckled the tomatoes with icing gel. Tip: If you don’t think the sweetness would compliment this snack you could always use an edible black marker instead. I have to confess that out of all the Back Yard Bug snacks, the ladybugs are my favorite. They’re so cute! Rinse and cut your celery into 3-4 inch slices. Apply peanut butter into the middle and insert two mini pretzels. Then add two candy eyes. Rinse and dry about 20 grapes. Carefully skew the grapes. Using the icing gel, draw a smile. Then add two candy eyes. Use your cracker as a guide to size your cheese. Place the cheese on top of the cracker. Cut grape tomato almost in half, leaving a tiny connection at one end. Open and lay flat on the cheese. Cut a black olive in half and place upside down at top of the tomato. Place the eyes in side the black olive and add the spots with icing gel. Be sure to check out the other bug projects from this week! I’m assuming she used the icing gel to stick them on. Not sure though. Where do you get the candy eyes? These are so cute! Wilton makes them and I’ve seen them by the baking stuff at Michaels, Hobby Lobby or even Target! A balsamic reduction would be good for the lady bug dots too, if you didn’t want the sweetness of the icing. For the black dots on the ladybug… Dip a toothpick in a drop of olive oil, dot the oil on the tomato, and then stick a black sesame seed to each oil dot. To eliminate the sweetness of the candy eyes, cut small rounds off of the end of a cheese stick (or use small pieces of feta), and repeat the olive oil & sesame seed process. If you aren’t a fan of the provolone cheese, you can replace that with small pieces of spinach or romaine leaves. We have done it like this before, and it’s more like a bite-sized salad that the kids won’t fight you on! 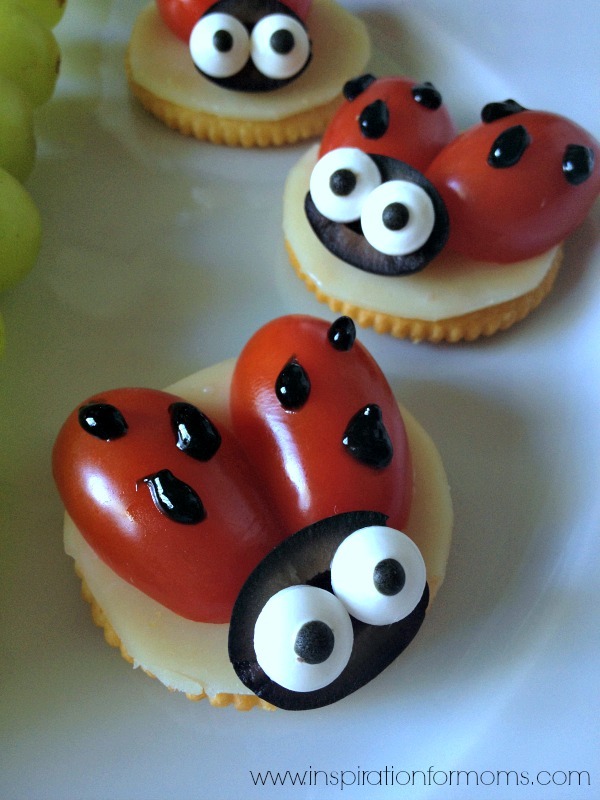 Tip: use balsamic glaze instead of icing gel on the ladybug tomatoes. Balsamic glaze is dark and sweet AND goes GREAT with tomatoes! I absolutely freakin’ love this!! My daughter is a huge picky eater and only thing on this she would normally eat are the grapes. I’m hoping with these cute buggies I can get her to try more things! Thank you for such cute foods! 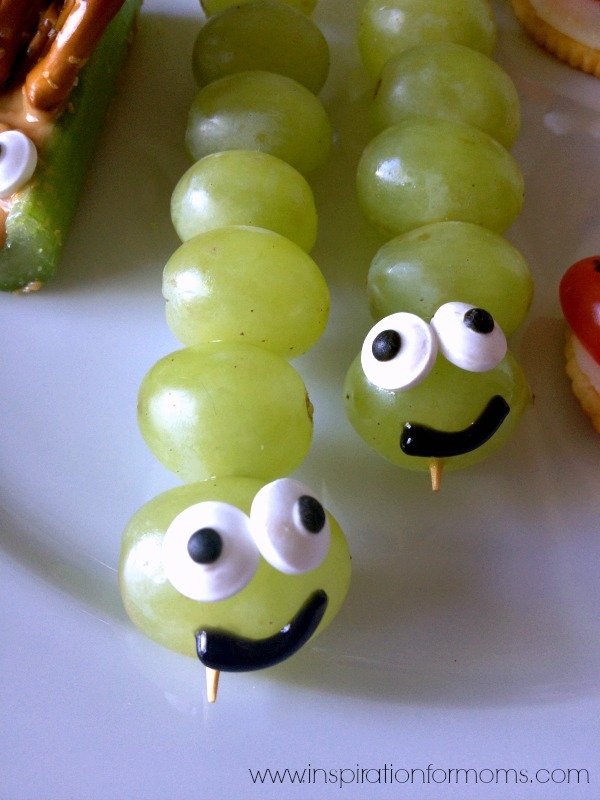 Grapes are a choking hazard unless cut in half.